“I save the best for last.” These were the words I heard the other night as God’s presence came on me at the end of our weekly Soaking time. We had already been resting and waiting in God’s presence for an hour and I was ready to circle up with closing prayer. But then…unexpectedly….His glory came. This happened a few weeks earlier, as well. The last five minutes of our hourly ritual turned from simply waiting to being weighted with His manifest presence. When we were transitioning to finish our time of worship, He came in and began to minister at the very end…at the last. For those who will tarry and wait, I will come. For those who pull on my heart, I save the best for the last! This idea comes from John 2 where Jesus attended the wedding at Cana and turned the water into wine – unexpectedly – when it wasn’t expected and it wasn’t time! Jesus himself said it wasn’t “his time”, yet (John 2:4). So, what changed His mind? SOMEONE PULLED ON HIS HEART and HE POURED OUT HIS BEST. It was his own mother that stepped out in faith and decided to override her son – her Lord – and dare to believe that His heart was bigger than His timetable! Mary had told Jesus that there was no more wine! They had run out after hours of celebration. When she mentioned it to him, he simply said, “Woman, why do you involve me? My hour has not yet come” (John 2:4). What appears to be a rebuke is actually quite the opposite. “Woman” is not a disrespectful term. In the Greek it is actually a term of endearment. He is not rebuking her. He’s baiting her! I imagine He even did it with a twinkle in His eye! He was not challenging her understanding, He was challenging HER HEART. What appeared to be a reminder of some sovereignly divined scheduling and ordering of events, turned out to be an INVITATION. He was testing her…just like He’s testing us. What did she really want? What did she really believe? Would she simply acquiesce and quietly sit back in obedience waiting for that “magical moment” when it was “time”? Would she feel guilty for even suggesting the thought…or…would she dare herself to believe in everything she had been secretly hiding for years – that He was, indeed, the Son of God and able to do….anything. How well had she learned to know the power of His love through the years of intimate relationship with her Son? I imagine as she looked in his eyes that reflected immense pools of love and affection, she decided to take the bait and step out. In a bold move of confidence and authority, she tells the servants, “DO WHATEVER HE TELLS YOU!” I can just see her smiling back at Him as if responding to His challenge with an equal amount of daring love and adventure. In her simple yet profound response, she not only declared that He COULD change things, but WOULD. All that she had come to know through years of love and affection with this One she had borne, she KNEW His heart and PULLED ON IT. THIS is what set things in motion for Jesus to turn the water into wine. The whole point of this story is not a retelling of Jesus’ first miracle. 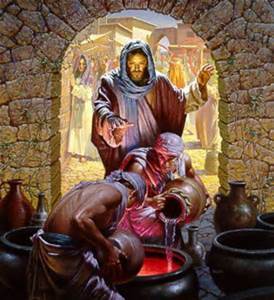 Turning water into wine was EASY for Jesus. The real miracle was Mary’s faith and bold declaration in KNOWING HIS HEART and CHANGING HIS MIND. We are in desperate need of NEW WINE in the Church. We need a fresh infilling and empowering of the Spirit of God. Many have been waiting and watching feeling like our wine is running out. We have questioned God, debating about WHEN or HOW this outpouring of New Wine will happen. Instead of pondering and debating eschatological signs and wonders, perhaps we should be responding like Mary did. Perhaps it’s time to step out in a bold faith that His love is stronger than our interpreting of the times. Yes, there are things that need to align – just as prophesies needed to be fulfilled before the cross. But, have we so focused on religious checklists and prophetic fulfillment that we have forgotten the very essence and nature of His heart? For those who have been praying and waiting for God to reveal Himself, He is reminding us that the BEST IS YET TO COME…if we but press in. He is looking for some Mary’s to respond to His voice and PULL ON HIS HEART to break through traditions of man and religious protocol to release the fresh wine of His Spirit. TIME may be in His hands, but the power to release the wine is in ours.